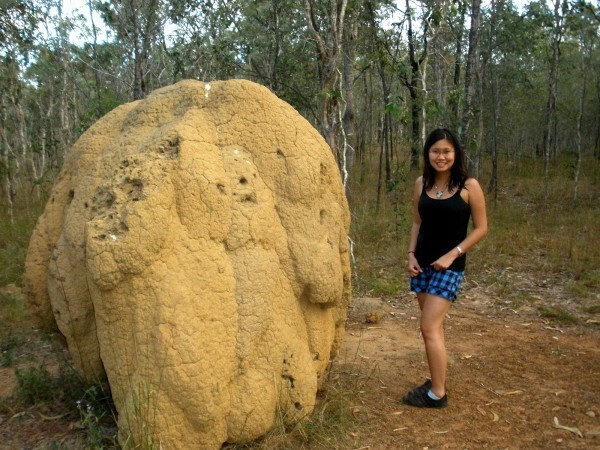 As we drove around in the savannah of far north Queensland, Australia, we saw so many big termite hills. Thousands and thousands of them. Sometimes they are called mounds, termitaria, or anthills, even though they are the nests of termites, not ants. Many of them that we saw were around 1-3 meters high. Some of them had a more amorphous heap shape, but some of them have conical shapes that made them look like brown fairy castles. Too bad we didn’t spot a giant one, as we read ones up to 6 meters high ones are not rare in northern Australia, and they can even reach 9 meters in Africa’s savannah. However, this is a representative picture of what we saw there. Tell us about the biggest termite hills that you’ve seen! Or tell us about biggest insect nest that you’ve seen! Yeah, I would love to see the giant one too! Those are some big ones. I saw some in Africa that were about 5 meters tall. Now where did I put those damn photos anyway…..
Hey, show me the photos if you find them! 5 meters tall, I wonder how it feels to stand beside it. Very cool, the termite mounds I saw in northern Australia were taller and skinnier than that one. They do have a very distinctive look though. We saw a few different kinds (shape and color), and I can’t believe this is the only one that I took the pictures! Haha, I know what you mean. Standing beside it, I kept imagining they would all crawl out and cover my body… like insect attack in horror movies. But in fact I didn’t see a single creature around that time. Crikeys that is a large hill. I don’t have any insect stories as I try to stay away from them! I know what you mean! I only approached it close because it was right near the road and I saw no insects walking around. Aaah, that’s huge and creepy…haha! Don’t think I would be brave enough to get that close. Haha, that’s the only one I walked to so near, because it was really close to the road, and I saw nothing crawling around. There are a crazy amount of these giant things up north Cool photo! Thanks, Brooke! There were sooo many of them indeed! we have termites here in florida but none that makes mounds as big as these! 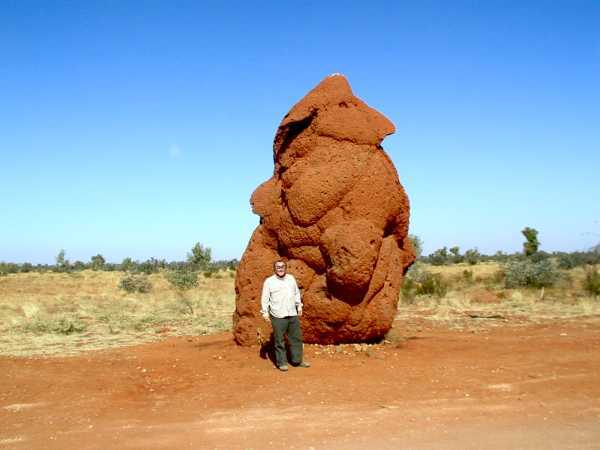 Yea, I don’t remember seeing giant termite hills in Florida as well It’s better that way..
I’m pretty sure I saw termite mounds on the Tiwi Islands, off the northern coast of Australia, about an hour from Darwin. They weren’t as gigantic as the ones you saw, though! Wow, I somehow associated big termite mounds with savannah in a big land (continent-y), instead of island thing. I once bought a carving of “Itz Am Na” — the Maya God of everything for $25 from a local craftsman somewhere around the Caribbean side of Mexico and brought it home. It was about an inch thick, 5″ wide and a foot high. A month later it started buzzing and was taken over by termites. It freaked me out. I attacked the small, but noisy, carving with a giant broom and eventually dunked it in water trying to save Itz Am Na. When that didn’t work, I put it in a sack and threw it in a garbage can. It took three weeks to get the buzzing out of my ears and I am still looking for a new Itz Am Na. I cannot imagine standing next to a mound of termites 500 times the size of my infested little carving. Gives me the willies just thinking about it. I hope one day you can find the non-infested Itz Am Na! Heheh, I was relieved when I saw the surface was clear. Cockroaches are so annoying, especially when they fly targeting that little space between your 2 eyes and nose. Hate them! This is pretty huge termite hill! The biggest termite hill I’ve seen before is about 3ft tall. Not as huge and as big as human beings! I wonder how many years this was formed. Australia is awesome place for travelling, This Winter Season I would be in India So, I am Indian Travel Agents in Sydney. It was a nice experience to read savannah of far north Queensland, hills. I feel good to mounds, termitaria, or anthills, nests of termites etc. overall it was really a good experience to know about of this articles.